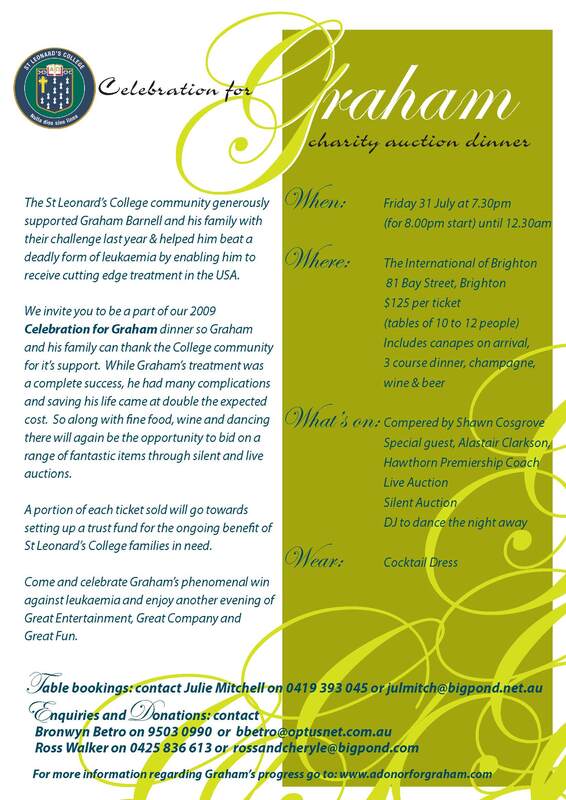 I am thrilled to announce that The St Leonard's College Community has organised another Charity Auction Dinner evening for Graham. It is to be held on Friday 31st July and promises to be a fantastic night. We are very involved with this year's event and are fortunate to have been able to book the event at the newly refurbished International of Brighton in Bay Street. Have a look at their website, the renovation is spectacular and I personally can't wait to see all the candles lit in their gothic candelabras! The theme this year is "Celebration for Graham". We met the "Challenge" last year and as you know Graham's health is slowly improving and wonderfully he is leukaemia free but we still owe a great deal of money due to many complications adding to the overall cost of Graham's treatment. So, the event will be a significant help to us but also a wonderful opportunity for us to personally thank our many generous supporters. In addition, a portion of the money raised will be set aside for any St Leonard's families who may find themselves in difficult situations in the future. Please click on the image to the right to see the flyer for 2009. Tickets are $125 per person and include canapes on arrival, 3 course dinner, champagne, wine & beer and entertainment. If you would like to book a table of 8-10 people, please email me and if you would like to donate items to the auction, please contact Bronwyn Betro on 03 9503 0990 or Ross Walker on 0425 836 613. 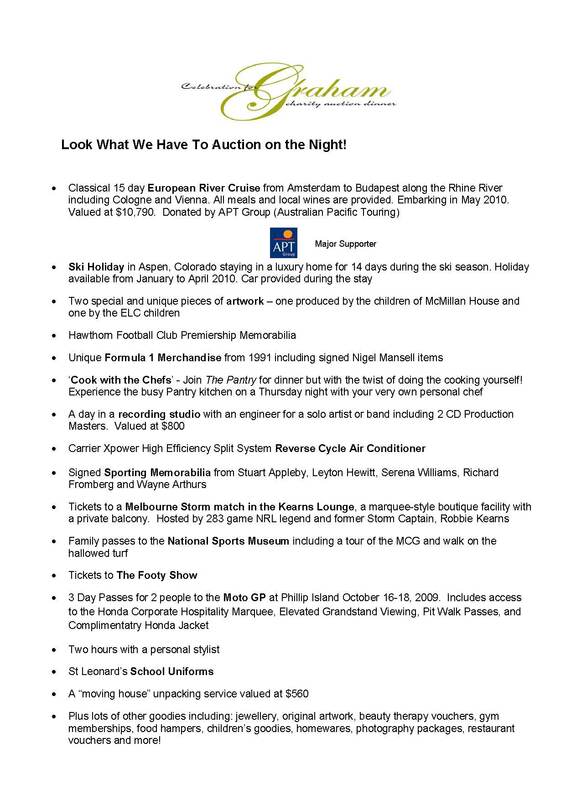 Click on the images to the right for the flyer about the event and the auction items available on the night.